France's lower house of parliament has approved a new anti-terrorism law intended to bring an end to a nearly two-year-long state of emergency. The law will incorporate several measures first authorised under the emergency arrangement. They include easier searches of homes and confining individuals to their home towns, without judicial approval. Most people in France approve of the move, but it has been criticised by rights groups. A state of emergency was first introduced after the attacks of 13 November 2015, when militants from so-called Islamic State (IS) killed 130 people in gun and bomb attacks in Paris. It has since been extended six times, but there was a consensus that to continue with the state of emergency indefinitely would be undemocratic, the BBC's Hugh Schofield reports from Paris. The bill was approved by by 415 votes to 127, with 19 abstentions, and is expected to become law before the latest state of emergency extension expires on 1 November. Interior Minister Gérard Collomb told parliament on Tuesday that the threat level was still "very serious", saying: "We're still in a state of war." The new law will allow members of the government - rather than judges - to approve the confinement of individuals to their home towns, requiring them to report to police once a day. The authorities will be allowed to mount security perimeters around places deemed at risk - such as railway stations and airports - within which people and vehicles can be searched. Mosques or other places of worship can be shut down if preachers there are found to be promoting radical ideology. A recent poll by the conservative Le Figaro newspaper found that 57% of French people were in favour of enshrining the measures in law. 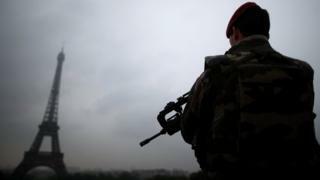 But Bénédicte Jeannerod, France's director for Human Rights Watch, said France had been progressively "weakening" judicial oversight in its counter-terrorism efforts, and "the normalisation of emergency powers crosses a new line".